April is Autism Awareness month. To commemorate this day, The Bay School students collaborated to create a mural made entirely from salvaged blue jeans. For all student exhibits, our parent volunteers strive to find art materials in the plentiful supply of discarded items already existing all around us. Families enjoy donating things that would otherwise be thrown away. It is exciting to see these items become something beautiful. This is an art movement that is growing, called up-cycling. This blue jean ocean mural was made using torn pieces of jeans and glue. 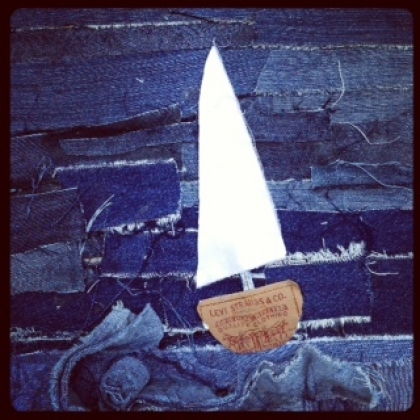 The sail boats are made of the tags commonly found on the back waistband of Levi’s. Even the bits of thread created when the jeans were ripped into strips are used. These left over bits become the swirling foam of the ocean waves. The remaining bits of jeans were used to make patch work birds that perched throughout the window exhibit in the Rittenhouse building in downtown Santa Cruz, where all those who passed by were treated to a whimsical scene through a window framed by black and white photographs of the students faces.